I scored big at the thrift shop a few weeks ago. Someone had unloaded a large stash of high-quality cotton knits, mostly interlocks, but some polo pique and French terry as well. I bought three 1.5-yard cuts of interlock for $15. A good investment, because cotton knits never last long in my stash. 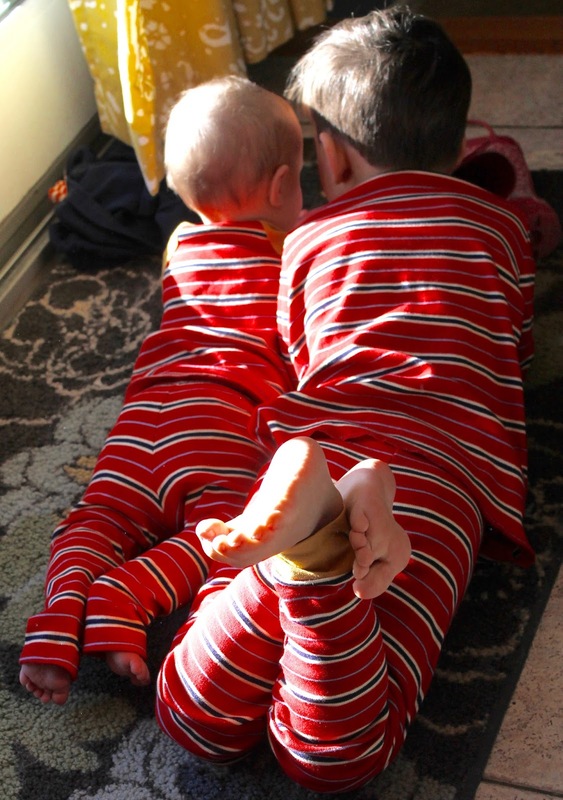 This cut was turned into coordinating little bro-big bro pajamas. 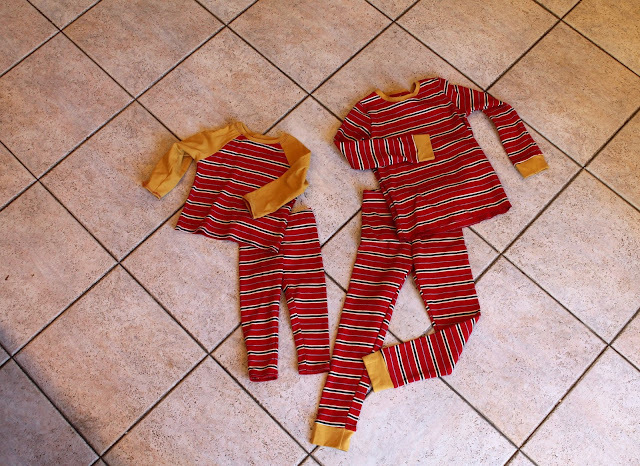 Both bottoms were made using the Oliver+S Playtime Leggings pattern. G's top is the Oliver+S School Bus T-Shirt. 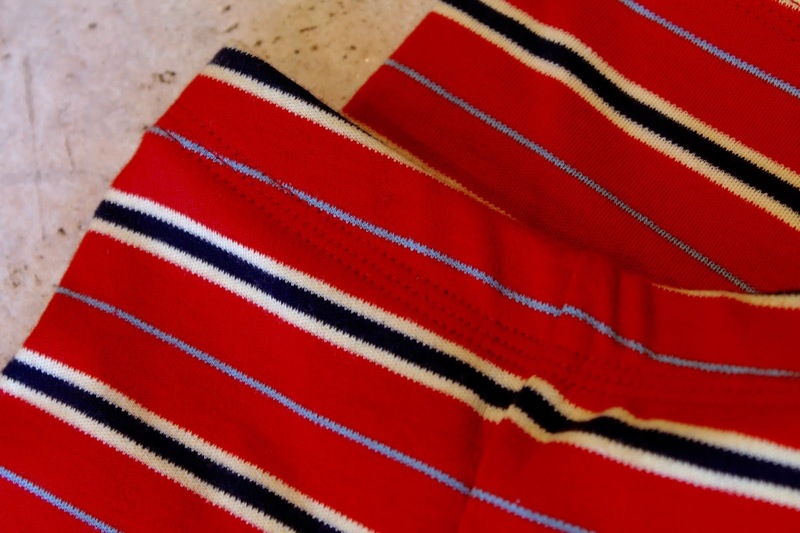 Both are sewn in a size 5 with added cuffs. I serged the shirt hem to add more length. He just turned 3 and still wears size 3 normally, though he is almost into 4s. I hope these pjs will fit for two years. 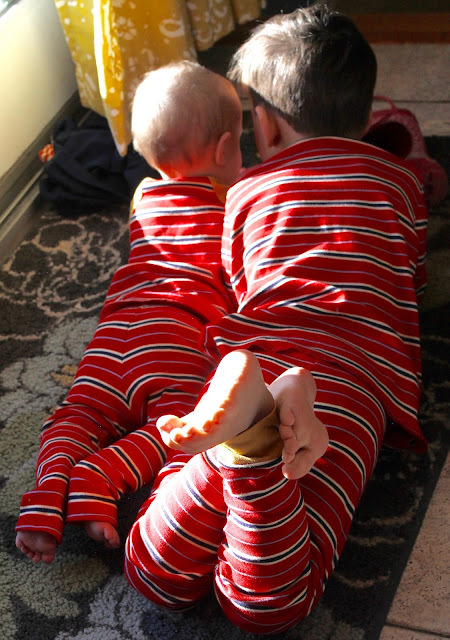 He did only recently outgrow the bottoms from these pjs that I made him right after his first birthday; I hope this new pair wears as well! The sewing on these was very straightforward, though I had a good deal of trouble using the triple stitch on my coverstitch machine for the first time. It was a real pain in the neck, which is particularly annoying because the triple stitch was the reason I chose the Brother coverstitch over the similarly-priced Janome. 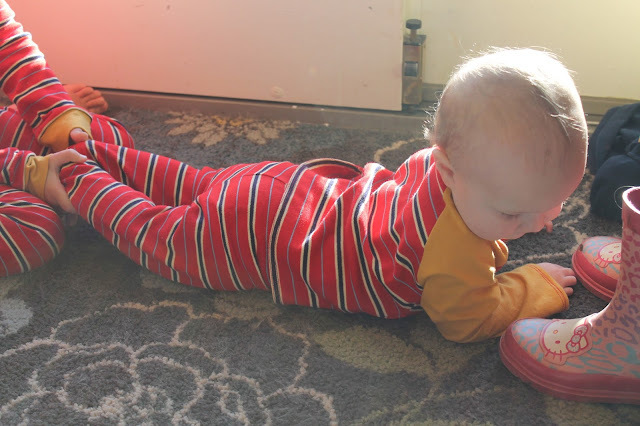 Niko's pants are also Playtime Leggings, and his top is the Oliver+S Field Trip Raglan, in the 12-18 month size. Both are quite big on him, but I don't need them to fit for a few months yet. 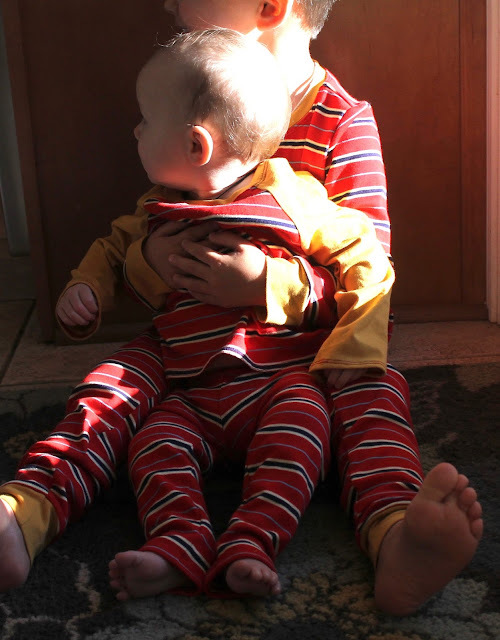 The sleeves on his top, as well as the neckbands and cuffs on his and G's pjs, are made from Art Gallery knit in Sahara Sun. I have used the heck out of this one-yard cut for trims on five other projects, and now that I am nearly out, I think I need to buy more. Mustard is so versatile! Gabriel is super-thrilled to have matching pjs. It will be interesting to see how long he enjoys matching - Natasha stopped tolerating matching outfits at about 5 and a half. Hopefully the boys will give me a few more years of matching. My coverstitch regularly takes a dislike to some knits and won't sew them well. I now keep a snippet to compare when I run into trouble. Thanks Nicole, that makes me feel a bit better as I know you have a quality machine!